Towards the end of my conversation with Charmaine Seah, the mother of two regales me with the perfect anecdote to encapsulate the nauseating vanity and posturing of Instagram Mom (i.e. Instamom) culture. In return, I tell her a story that enthralled me for its hyper-reality: last year, an American Instamom actually admitted to worrying that pictures of her son on her Instagram never received enough likes. Personally, I think the resulting online outrage was justified, but I’m not a mother nor social media personality like Charmaine, whose Instagram account (@eleventhour) is a dizzying visual diary of everything and anything in her life. Instamom culture may have gotten its fair share of criticism, but most of it has centred around the downsides of being obsessed with social media. Thus far, we have yet to explore its bigger implication: how becoming an Instamom seems to strip any woman of her own personality and pre-child identity. Once someone gets sucked into being an Instamom, she is a new person. She bombards her followers with IG stories of her child’s milestones, updates on reputable pre-schools, positive captions on how motherhood has changed her life, photos of her child’s OOTD, and so on. At least thrice a day. Admittedly, the pervasiveness of Instamom culture has bothered me enough that I have muted almost all friends who post mostly child-related updates. Every time someone’s child pops up on my newsfeed, I am reminded of our outdated societal pressures for women to get married, settle down, and have kids by 30. More unnervingly, these updates remind me that my life won’t be fully mine if I become a mother. Every single thing I do would have to revolve around my child, lest I be crucified as being ‘irresponsible’ or ‘selfish’. Thankfully, Charmaine is more level-headed. To an outsider, she might seem highly involved in Instamom culture since she frequently updates Instagram with pictures of her two daughters. At the same time, she doesn’t condone the “toxic behaviour” of the aforementioned American Instamom, although not all Instamoms treat their child as a commodity to enhance the parent’s social media persona. 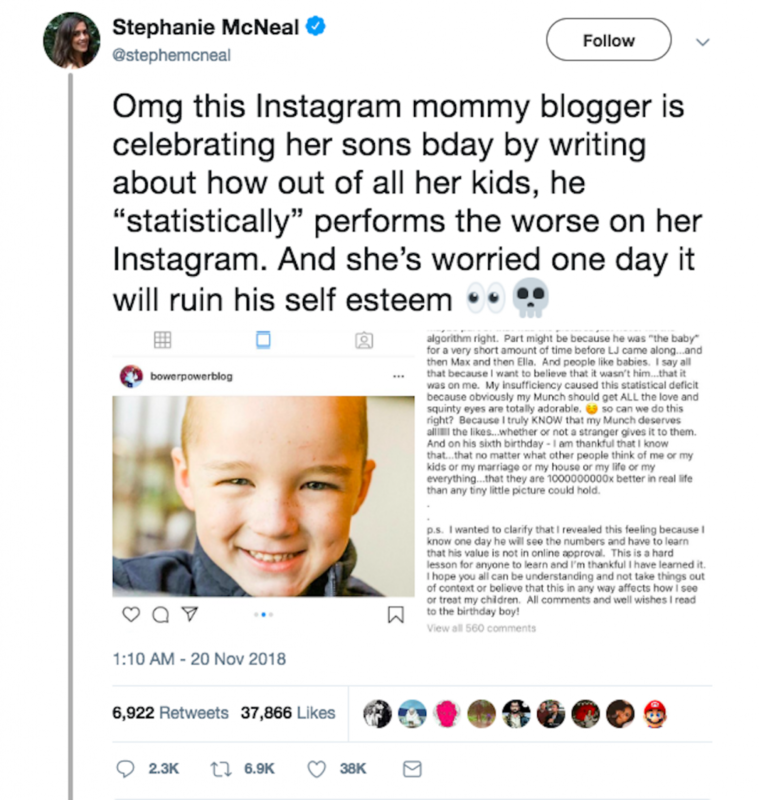 The tweet that started the online indignation towards the Instamom who was concerned that one of her sons wasn't performing as well "statistically" as her other children. Her original Instagram post has since been deleted. 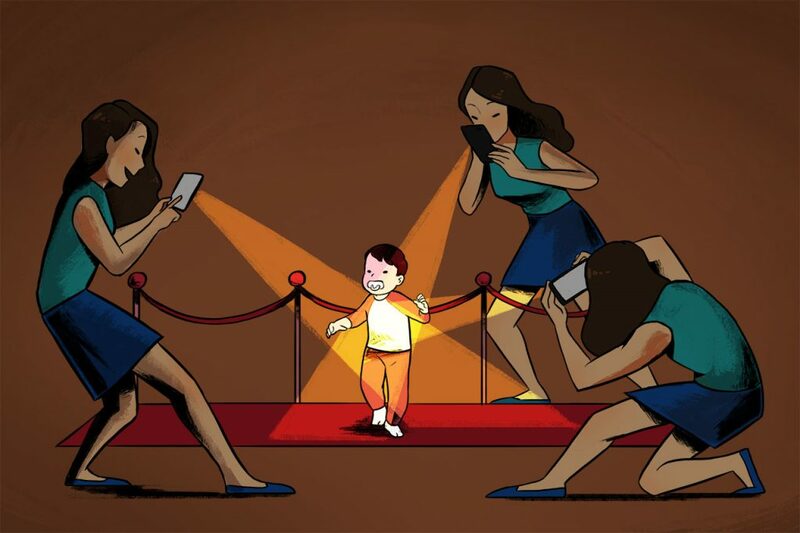 Underpinning this compulsion to place a child at the front and centre of one’s life is the status-conscious and anxiety-driven nature of Instamom culture. Every mother doesn’t just want to be the best mother to their children; they also want to appear perfect (or better) in comparison to other mothers. Inevitably, there arises an intense desperation to keep up with the Joneses, not least because it is scientifically proven that a woman tends to experience greater stress to attain perfection than men in all areas of her life. This tireless perfectionism often manifests in mothers defining themselves by how well they meet their child’s needs. And because Instamom culture teaches mothers that the external validation becomes a yardstick for what a good mother they are, motherhood is treated as a competition even before women actually become mothers. Many mothers end up putting in more visible effort to reinforce their ‘good’ parenting. And often, they may unwittingly project their own aspirations (and anxieties) onto their child. So it’s refreshing when I speak to Siti, a 30-year-old mother of two who neither participates in Instamom culture nor is interested to do so. Initially, she felt pressured when her son hadn’t achieved the same milestones that other Instamoms said their children had. But she’s also aware that every child progresses at their own pace. 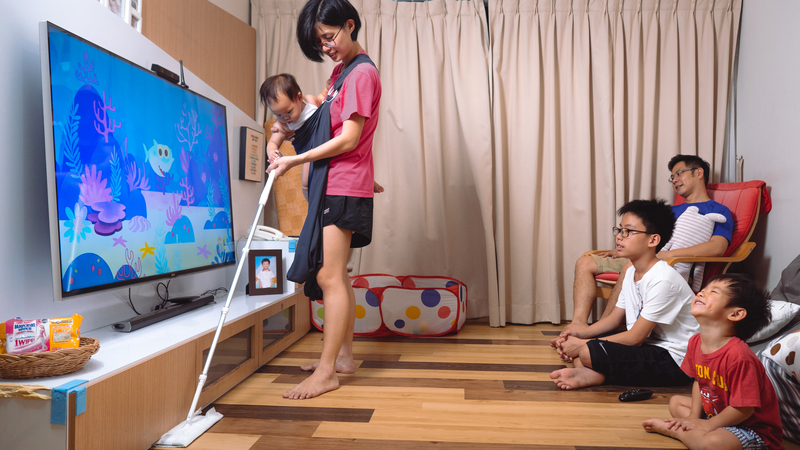 Although most of Siti’s time is spent with her children, and she admits she has barely any time for friends, she spends her spare time catching up on dramas to keep sane. Performing on social media is nothing new. But with Instamom culture, this need to be perfect online is driven by the compulsion to allow our children—or the idea of having children—to dictate our lives. Similarly, Grace, a mother of one in her early thirties, maintains that keeping interests which are completely detached from her role as a mother is “very important” for her personal growth and development. Otherwise, it’d be too easy to let her entire life revolve around her child. The pressure she feels to be a perfect mother, including being at her child’s beck and call, stems from within. It exists because she loves her child, not because she seeks external validation. But she also posits that women feel the external pressure due to biological factors and gender roles. “Society emphasises the role of mothers as the main caregiver, such as through four months of maternity leave versus two weeks for fathers. I guess these make you believe that you are supposed to fulfil your ‘duty’ as the perfect mom,” she says. That said, Grace is neither bothered by Instamom culture nor does she partake in it. She simply enjoys reading other mothers’ sharing, though she rarely posts anything related to her own motherhood journey. “Of course, most people, including myself, will choose to post good or happy things, but that doesn’t mean our families are perfect. I think social media creates a false sense of happiness. There is a certain kind of image that you want to portray, sometimes subconsciously, and I find that difficult to maintain,” she says. Grace’s comments and Turkle’s research remind me of someone I knew, who would take pains to portray herself as a loving mother. 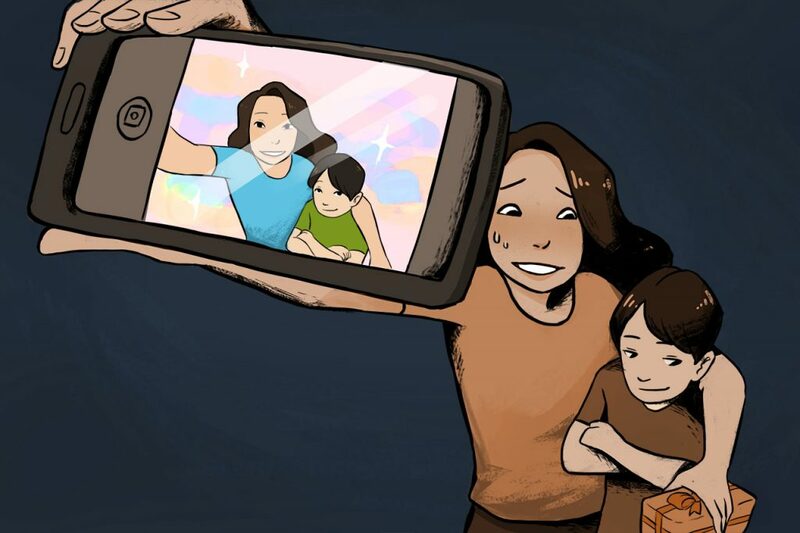 She posted Instagram Stories and photos of her children incessantly, all while she struggled with envying other women’s lives—especially those who were single and unmarried. It made me wonder: if not for the punishing nature of Instamom culture, would she have felt inclined to glorify motherhood by letting her own identity take a backseat? That is to say, I didn’t think she should’ve had to pick between displaying her love for freedom and her love for being a mother, all while feeling guilty for not being the quintessential Instamom. But I speak from the detached perspective of singlehood; perhaps I can only truly empathise with the life-changing bond between mother and child if I become a parent. All the same, I often recall her story as a reminder that no matter how tightly curated our online persona may be, a pretty filter and happy family moments on Instagram Stories don’t mask our daily, imperfect realities from ourselves. And it’s easy to develop envy for our own Instagram personas when we fail to live up to the artificial bliss of our online lives. My mother once told me she refused to put my sister and I at the centre of her life when we were born. In hindsight, it was one of the most important things she's ever told me. With almost 20k Instagram followers who are privy to her several updates a day, Charmaine is cautious not to create more anxiety and pressure for mothers to perform. Even though she believes in “authentic sharing”, she doesn’t intentionally plan a balance of good and bad news; her updates are organic and comprise whatever memory she feels like recording at that time, even if it’s not necessarily pleasant news. But authenticity can fall flat if it appears calculated to show what ‘unfiltered’ motherhood looks like, such as framing a child’s cheeky misbehaviours as ‘real’ and not frustrating. All this merely reinforces another unattainable ideal of motherhood to aspire towards. It’s the Catch-22 of Instamom culture: on one hand, some people might feel inferior in comparison to updates like Charmaine’s—as unfiltered and natural as they may be—because they don’t have equally ‘exciting’ content to share. On the other, it seems borderline insane to expect Instamoms to refrain from sharing uncontroversial updates about their children just to placate detractors. From what I gather from Charmaine, mothers bear the brunt of societal expectations, from getting judged for not breastfeeding to having controversial opinions about motherhood. But perhaps what’s more dispiriting is that the majority of this judgement appears to come from women and mothers themselves. “There are so many women out there who’re just waiting to pounce on something you say. That’s not nice. It’s not kind and it’s not helpful. There is definitely more pressure once you become a mother,” she says. In turn, this pressure can make mothers feel as though they need to signal that they are being a good mother, creating the eventual need to become an Instamom. Men, on the other hand, almost always get away with “doing so little, and still get called great dads”. We may assume that Instamom culture only affects mothers, but it’s inherently tied to our expectations of fatherhood and masculinity too. Instamom culture reinforces that the mother is the parent who’s more nurturing, more involved with the child, and more likely to write emotional captions about parenting. We inadvertently encourage dated masculine stereotypes about fathers being the distant parent whose main job is to be the family breadwinner. As a result, when fathers do everything an Instamom does, such as allow his life to totally revolve around his child, his entirely normal actions get placed on a pedestal. It’s patronising and insulting to both genders. Perhaps then the most authentic manifestation of parenthood should be an explicit rejection of said culture, how it shapes our view of gender-specific parenting roles, and how it influences us to give up our own identities. 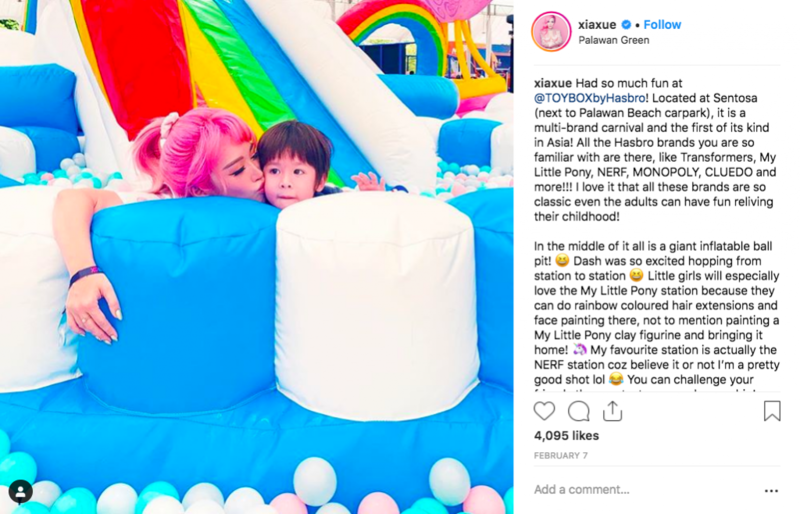 While many of us think Xiaxue is the epitome of an Instamom, the culture doesn't just affect influencers or those seeking to be one. To be clear, I am not opposed to marriage or being a mother. But I am emphatically against letting Instamom culture define what motherhood should look like, especially because Instamom culture seems to dictate that appearing like a good mother on social media translates to being a good mother/person in real life. This isn’t just problematic for parents, but also for children, who can end up subtly coerced into conforming to an aesthetic that’s dictated by their parents. Nonetheless, over the last five years, I’ve grown utterly fascinated by how stupendously parenthood and Instamom culture can change someone. Witnessing the transformation in someone’s online persona after birthing another human is equal parts inspiring, intoxicating, and insufferable. 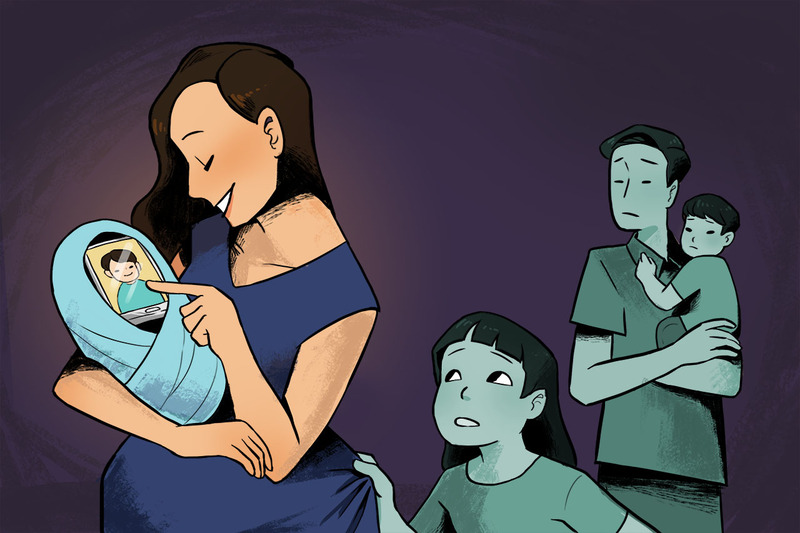 So when I first pitched the idea for this story to my team, in my own self-indulgent way, I wanted to explore where this internal tension stemmed from, and reconcile my complicated, conflicting feelings towards motherhood. Do I secretly envy the Instamom life because I want to be a mother, or do I just like the idea of perfection that the Instamom caricature represents: happiness, a loving marriage, and a wholesome family? Does the envy occasionally eat away at me because I am fundamentally afraid that I won’t find anyone to share my life with? For all my professional achievements, am I in the end just a girl who wants to start a family? And, if so, then why do I feel uncomfortable with that life choice for myself? Do I even want to settle down, or do I think I want it because I was never shown alternative options of happily ever after when I was younger? In trying to answer these questions through my conversations with the three mothers, I remembered being a wholly different person at 21. As a planner by nature, I’d crafted the ultimate timeline for myself: get married by 25 and become a mother by 28. My career goals wouldn’t be left in the lurch either; I’d somehow convinced myself that I could have it all. After my then-boyfriend broke up with me, it sunk in that my dreams of getting married and having children were never truly mine. These ideals hadn’t been forced upon me, but I suspect I never properly thought them through because they seemed like the only ‘logical’ outcome of a relationship. I may never have concrete answers to my questions. But at least with regards to motherhood, I’ve realised that I’m absolutely happy to raise children who don’t have my DNA. Embracing this realisation has liberated me from the race against my biological clock, as well as the obligation to let the way I live my life now be defined by my potential children. Still, it can take years to accept that just because you’re no longer the person you were, it doesn’t mean you know who you are. My self-doubt and insecurities persist even though I have friends, who are married or mothers, who tell me they’re quietly envious of how I seem to relish my singlehood. In the end, Instamom culture is a hot mess. It’s a manicured version of motherhood, yet it’s also a broader commentary on the ways in which parents (especially mothers) are expected to sacrifice their dreams, interests, and identities for their children. The resulting anxiety, envy, vanity, and shame cultivates a pursuit for perfection and a need for validation. Unfortunately, these come across in aggravating attention-seeking behaviour. It doesn’t exactly evoke sympathy for Instamoms, who are arguably perpetrators of their own prison. But at least for me, Instamom culture is also the ghost of a sister life I could have led. And with every glossy Instagram update of another friend’s child, I am learning to exorcise the versions of myself that drew their final breath a lifetime ago. What is one Internet culture that you want us to analyse in a 2,500-word article? 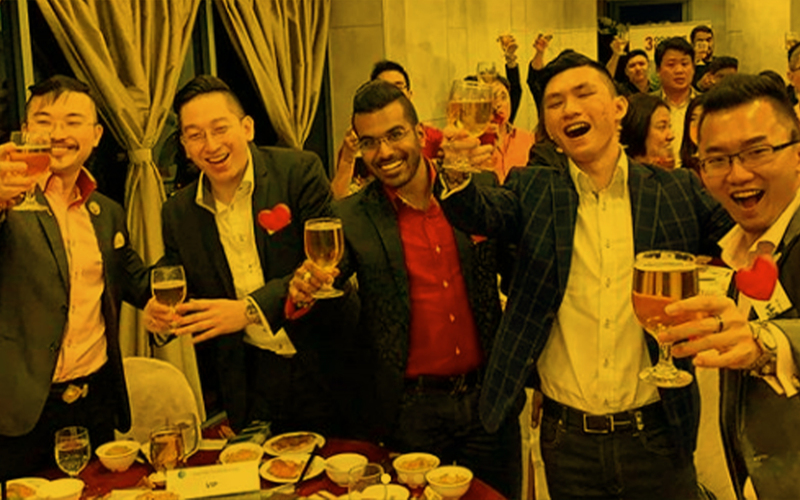 Tell us at community@ricemedia.co.